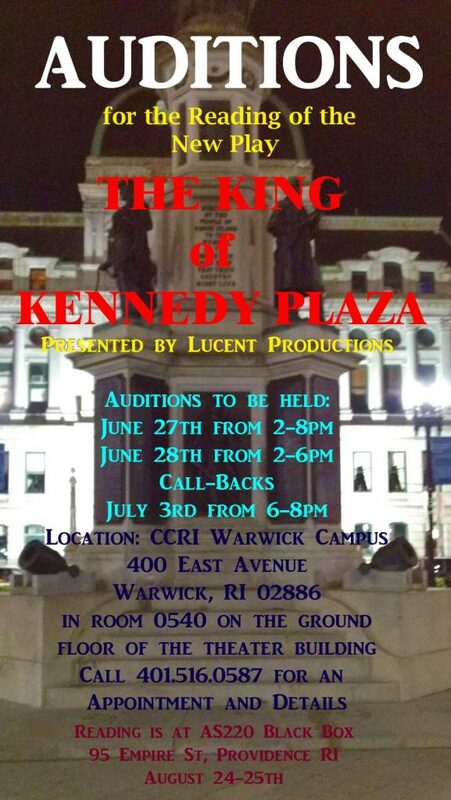 We are auditioning for the reading of the new play, The King of Kennedy Plaza on August 24th & 25th at the AS220 Black Box Theater in Providence, RI. The play is about the alternative culture at Kennedy Plaza. It deals with Oxycodone addiction, mental illness, homelessness, sports injury related addiction, drug dealing, Veterans and other concerns. The play intends to influence the suspension of judgment and the creation of compassion the people who “live” there. You will need a 2-3 minute dramatic monologue, a theater resume if you have one. Auditions are by appointment. Please call 401.516.0587 anytime.